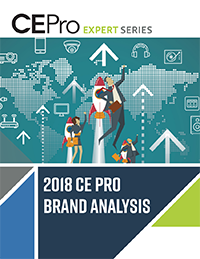 Amazon Alexa, not surprisingly, is the top voice-control brand among CE Pro 100 high-revenue integrators, but Google Assistant is starting to register, according to the 2018 CE Pro 100 Brand Analysis. Amazon Alexa is still king of voice control among CE Pro 100 integrators, but all players enjoyed strong showings in the 2018 CE Pro 100 Brand Analysis, indicating strength in the voice-control category in general. Among the largest home-technology integrators, Amazon Alexa is the most-specified solution for voice control. No surprise there. But Google Assistant made substantial gains this year over last, according the the 2018 CE Pro 100 Brand Analysis. From a barely-there 5% usage rate among CE Pro 100 dealers last year to a whopping 24% this year, Google Assistant shows it has legs in the channel, possibly due to the growing ecosystem of Google/Nest devices and their ease of integration with Assistant. Apple Siri picked up some followers over the past year, and will likely pick up more once IP-based integration with Apple TV becomes available this year. As the Brand Analysis indicates, Apple TV is specified by 39% of CE Pro 100 dealers -- more than Roku in the media-streaming category, but less than Sonos. The significant gains across all three big brands indicates a willingness by smart-home pros to install and integrate mass-market voice assistants. It's a big nod to the category in general. Start-up home-automation manufacturer Josh.ai registered this year -- interestingly since the company has only just begun shipping product. The strong showing likely is a result of integrators signing up as dealers to carry the product. 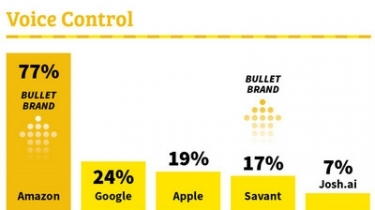 Savant is the clear favorite among home-automation providers, thanks to an early lead with Savant Remote, a touchscreen-based remote control with a microphone and home-grown voice-control technology built in. % CE Pro 100 integrators using each brand.